Between Monday 6 July and Sunday 12 July 1998, I did something I always wanted to do. That is to spend a week, travelling on Trains around the Midland Network. 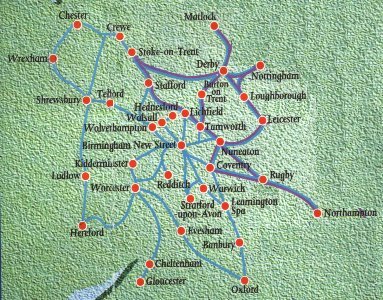 From the map above, the border stations are Hereford, Ludlow, Shrewsbury, Wrexham, Chester, Crewe, Stoke-on-Trent, Derby, Matlock, Nottingham, Leicester, Nuneaton, Rugby, Northampton, Leamington Spa, Oxford and Gloucester. Any train and any train operator was permitted within this area, with the exception of the Virgin Trains from Gloucester to Birmingham direct. I paid £37.25 (with a Young Persons Railcard) 1998 prices to enable me to travel off peak (after 9am weekdays and any time at Weekend). 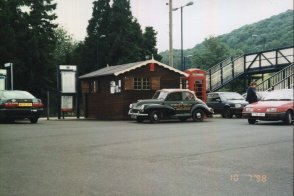 My starting station was Ledbury. I returned to Ledbury after each days travelling. There are other rail rovers available. Please consult your local train station. My final number of miles I have achieved was 2003¼ miles (3200 kms). The total duration of my trip was 43 Hours 55 Minutes. What now follows are the journey details and some of my photos from my trip. When I mention Home Station below, this means that I have been to that station the most often on that day, either set foot on the station or went on a train which travelled through.